Founder, Evita G. Kaigler, Esq. Evita G. Kaigler is the founder of the Law Offices of Evita G. Kaigler, LLC, established in 2006. She leads the firm through her proficiency as a music lawyer and consultant in the major recording, music publishing, and independent music markets. The firm serves as a deal maker for clients with companies such as Def Jam, Sony, Warner Chappell, Universal Music Publishing Group, Adidas, Red Bull, Coca-Cola, PepsiCo, Toyota, Calvin Klein, and Converse. As a legal and business affairs adviser, Evita represents some of Hip Hop’s top and rising stars such as Big KRIT, Joey Bada$$, Jarren Benton, Mick Jenkins, and some of the most celebrated producers and songwriters who have written and produced for Rihanna, Kehlani, Britney Spears, Ariana Grande, Mariah Carey, Jennifer Lopez, Rick Ross and TI. Future Music Attorneys launched in 2011. 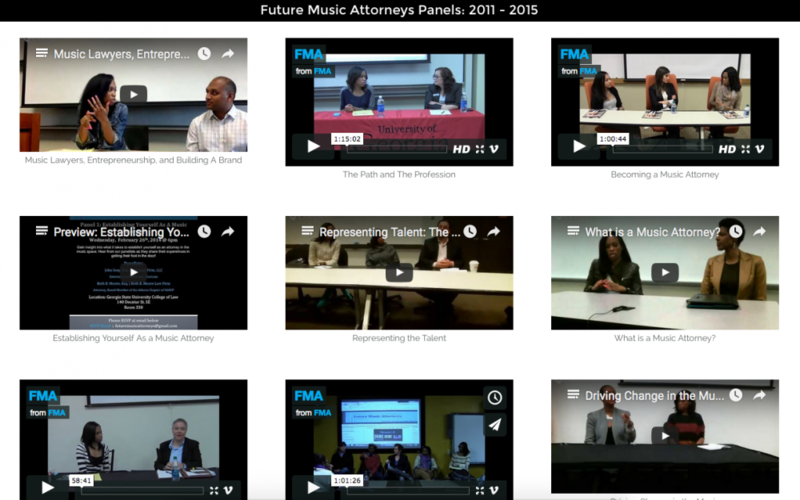 Over the years, we’ve had 22 panel discussions featuring 30 lawyers to speak with our students about law and the music space. To see our past panels, click here! We’ve covered various topics such as “Establishing Yourself As A Music Lawyer,” “Music Lawyers, Entrepreneurship & Building A Brand,” and “What Is A Music Lawyer?” Additionally, we’ve covered the role of intellectual property in the music space as well as a few important deals that music lawyers work with. Interested in becoming a member? Just send us an email to futuremusicattorneys@gmail.com with the subject “Membership” and we’ll add you to our email list for special announcements, panel updates, and various opportunities.